Invite your friends and the members of your church to attend the Second Annual Constitution Day Celebration at Mt. Hebron Cemetery in Winchester, VA next Thursday, September 17, 2015. The Constitution of the United States will be honored on Thursday, September 17, 2015 at Mt. Hebron Cemetery (305 E Boscawen St, Winchester, VA 22601). 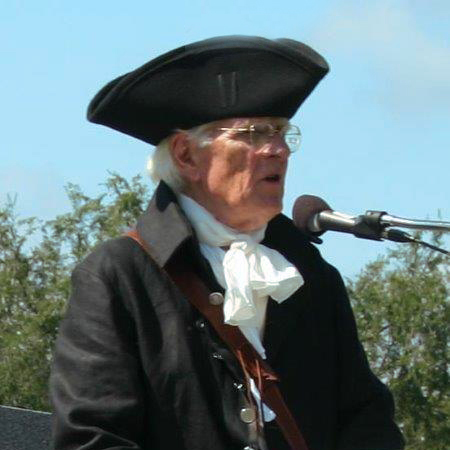 This second annual celebration of the Constitution is set to begin at 4:00 pm in the General Daniel Morgan National Cemetery, a part of Mt. Hebron Cemetery. The Constitution, approved on September 17, 1787, will be 228 years old that day. Community leaders representing citizens, pastors and students will remember the Birthday of the Constitution. Speeches reciting the importance of this document accompanied by prayers, and the reading of George Washington’s Prayer for our Nation will be offered. There are hundreds of Soldiers, Marines, and Sailors buried in Mt. Hebron who fought in all our wars to preserve our freedoms. Prayers will be said for our active military personnel and all veterans. The program will be concluded by the playing of Amazing Grace by piper William Wood, member of the Sons of the American Revolution. Following the service Liberty Man will answer questions about his great(x4) grandfather, Abel Johnston, who fought in the revolution. He will be in period dress. The public is invited to this celebration of thanksgiving and remembrance. Free constitutions will be passed out to attendees as well as a history, by Mark Quimby, of how we got the Constitution. The setting in General Daniel Morgan’s National Cemetery is fitting as General Morgan fought for our independence and a free United States. Morgan was a resident of Winchester and personal friend of George Washington and many of the Founding Fathers. The gathering will be among the graves of 40 veterans of the Revolutionary War and 42 veterans of the War of 1812 is most fitting. General Morgan is buried in Mt. Hebron Cemetery near many men he served with in the epic Revolutionary War. While it is known that more than 50,000 soldiers died in battle or from related injuries fighting for our independence in the Revolution it is little known that over 15,000 soldiers died in battle or war related causes in the War of 1812. This war was an attempt of the British Empire to overthrow our Constitutional Government and return the United States to British rule. They burned Washington, D.C., but did not succeed in overthrowing our Government led by President James Madison of Virginia. On Sep 3, 2015 a federal judge jailed Kentucky clerk Kim Davis in an act of judicial tyranny that highlights the depths we’ve sunk after rogue judges from the highest court in this nation presumed to “redefine” God’s definition of marriage. Her actions are a credit to her strongly held Christian beliefs and her faith that God’s Word is not something you “redefine”, except at your own peril. Her willingness to stand up for her beliefs should compel each of us and our friends and our churches to reach out immediately with all the means of support we can muster. This morning the Shenandoah Christian Alliance sent a “Thinking of You” Gideon Card with a message of encouragement and at the same time has donated a gift of 5 Bibles to be distributed in honor of her decision to serve her God. 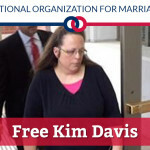 I suggest we each reach out to Kim and let her, and all those that are around her (both friend and foe), know that she is not alone, and that a court ruling that contravenes God’s natural law as well as the Constitution is no law at all. A video look at Mathew Staver’s interview following a visit with Kim can be found here. Note: Mathew Staver (and his organization Liberty Counsel) are at the forefront of fighting many of the liberal/progressive/humanist assaults on religious freedom in the US and are also worthy of our support). It’s also gratifying to know that we have future presidential candidates that are taking a strong position in support of Kim (and also, in defense of religious freedom and the sanctity of God’s Word). Please plan on joining us for breakfast to hear a presentation by Rachel Sargent from Virginians for Life. You can follow them on Facebook. Rachel was invited by Debbie Berg and will be telling us about her group’s efforts to save young lives. Please feel free to bring along anyone from your church (or group) that you feel may have an interest in what Rachel is presenting. And they may want to follow up with her after the breakfast. For those that may not have joined us for breakfast previously, you can get directions here. • “Marriage between One Man and One Woman” that God has decreed from the beginning of time. The Family Foundation of Virginia is conducting a “2015 Day at the Capitol” for Tuesday,Jan 27, 2015 at the Greater Richmond Convention Center (403 N. Third St., Richmond, VA 23219) beginning at 2:00 p.m. with Stella Morabito, a senior contributor at The Federalist, on “Living Faithfully in a Culture of Fear: How to Understand Political Correctness and Resist the Rush to Conform”. If you desire you will also be able to meet your state representative. The day’s activities will also include a legislative update from The Family Foundation’s policy team. At registration, attendees will be invited to attend a Town Hall meeting at 7:00 p.m. with Mike Huckabee, former governor of Arkansas and presidential candidate, and until last week, TV host of the weekly “Huckabee” program on Fox News. Seats are limited to afternoon program attendees only. Bus arrangements are made separate from program registration. Please be sure to get your afternoon event ticket by: Sign up here to reserve your spot or go to www.familyfoundation.org/events/. Bus Schedule and sign up Questions? Dean Welty – 540-438-8966 or email family@valleyfamilyforum.org or call 438-8966. A bus (Schrock Motor Coach) from this area will be leaving Strasburg at 9:15 AM and returning after the Townhall meeting with Gov. Mike Huckabee getting back about 11:00 PM – 11:30 PM. The next event that invites our individual and perhaps group participation is the June 19th ”March for Marriage” in Washington, DC. Anyone who wishes to participate (stand up and be counted) can go online to www.MarriageMarch.org to sign up and receive updates. There are few more defining issues in our way of life than God’s sacred definition of marriage between one man and one woman and we should make every effort to make our faces and voices known. A showing of tens of thousands of believers in Washington, DC on June 19th would send a strong message to our representatives, our out of control judiciary, and our “beyond belief” media that this country still has a very significant number of Bible believing mothers and fathers and families (AKA voters) that will hold them accountable for their leadership and their actions. We can only hope that the leaders of our churches throughout the Commonwealth will make the support of God’s definition of marriage a central part of their messages to their parishioners and that the people will respond by getting actively involved in what is going on around them. Our church, in coordination with the Shenandoah Christian Alliance will be supporting the National Organization for Marriage by organizing a bus trip on June 19th. with other like-minded individuals from across the country. Thursday, June 19th – March for Marriage at The Nation’s Capitol, Washington. D.C.
522/340 10 Crooked Run Blvd.